Evacuation Sledge With Safety Belts And A Foot Pocket. 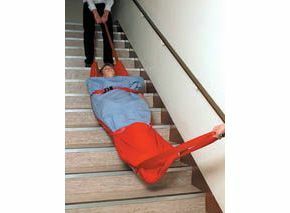 This evacuation sledge consists of dual inner foam - a firm lower layer to ride over any floor surface or stairs, and an upper layer for patient comfort. There are safety belts and a foot pocket to hold the patient in place, pulling loops at each end and a tough slippery coated bottom side. The loop at the head end is to hold back when descending stairways. The whole item is stored in a pouch and can hang on the wall. We purchased this for emergency use and it looks to be really robust and good quality.